The work of Travis Manion Foundation (TMF) is rooted in the belief that veterans and families of the fallen are among America’s greatest civic assets, and that the path toward bridging the civilian-military divide and uniting our communities begins by empowering our military community. 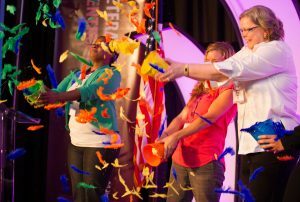 In leveraging the skills, experience, and leadership of veterans and survivors, TMF is building a nation of strong, character-driven individuals whose service ensures that our families, communities, and country thrive. 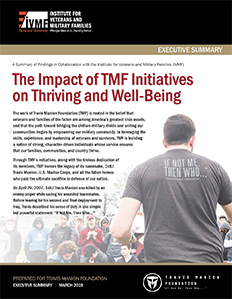 In partnership with IVMF’s evaluation team, this study looked at the effectiveness of TMF initiatives on improving the level of thriving and well-being among TMF members’, including veterans, families of the fallen, and civilians. Using the Brief Inventory of Thriving (BIT) scale, including questions about health, leadership, and community engagement, this study found that people who participated in more TMF programs experienced greater thriving. Mental Health Benefits. Veterans and families of the fallen who were involved in three or more different types of TMF initiatives were significantly more likely to report higher levels of emotional and mental health and have a better quality of sleep than those who only participated in one type of TMF initiative. Positive Impact on Young Adults. TMF’s Character Does Matter (CDM) program showed to have a positive effect on young adults’ attitudes toward both positive and negative behaviors. Increased Thriving. Participating in a myriad of TMF initiatives showed to increase thriving. Veterans and families of the fallen who participated in three or more different types of TMF initiatives have the highest levels of thriving. Civilian members experienced a similar level of thriving through TMF participation.